Well hello my sweets, how about the Junk Bonanza going on all week! Did you catch it? Did you check out those amazing projects linked up in the linky party? Did you enter to win my crochet pillows that I made but didn’t crochet? Anyway, today I am here to show you a little project I did with those awesome projects from Whisker Graphics, and a bit extra…. I tried to come up with a bit of original gift wrapping for a T-shirt combining a little of this and a bit of that…. It started out with this: a fun t-shirt I was giving as a gift to my little big brother who turned 50 (my-oh-my we are getting older…..). Instead of folding it, I rolled it up real tight, so it fit perfectly into the larger bitty bag. And it was more of a mystery package, that way too. Now when someone turns 50 they deserve more than a funny t-shirt, so I added a music gift card too. Those gift cards are the perfect size for the mini bitty bags. I glued the mini bag to a tag and attached the tag to the package with black twine. But I wouldn’t be Songbird if I didn’t think this package needed a bit more…. Since the theme of my gift was music…. 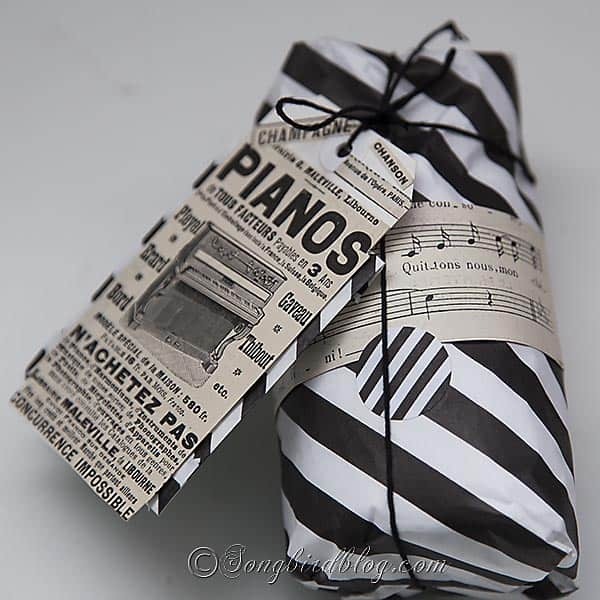 A strip of vintage music paper. and that tag had a backside too…..
More room for pretty vintage papers. I searched my 100 years old fashion magazines for some ads and texts that had a musical theme. I found this pretty ad for pianos that was the perfect fit. Thumbing through those fashion magazines was the most fun bit of this whole project. I so love those old ads, the fashion guidelines of those days, ‘reading’ ( my French is not very good) and definitely recognizing all the beauty worries of those ladies (turns out 100 years ago women were just as worried about wrinkles, hair growing in the wrong places, the proper skirt length, and how to make the perfect curl). I have a ton of these magazines. I will make myself part with some of them soon, and I’ll start listing them in my shop. Anyway back to the issue at hand. The package I made for my brother. I am not sure, my brother was into the vintage papers as much as I was. But the gift was happily received anyway. I think those modern Whisker Graphics packaging materials match up nicely with my vintage ephemera, they make a pretty combination. What do you think? Love or hate the combo? Do the men in your life appreciate a well packaged gift? Or do they focus on the content immediately? And how about those vintage fashion magazines, are you in love too?